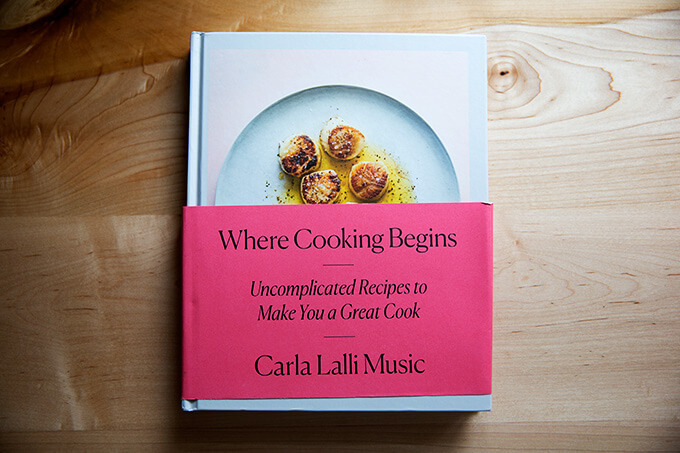 Carla Lalli Music’s book, Where Cooking Begins, arrived at my door Tuesday. 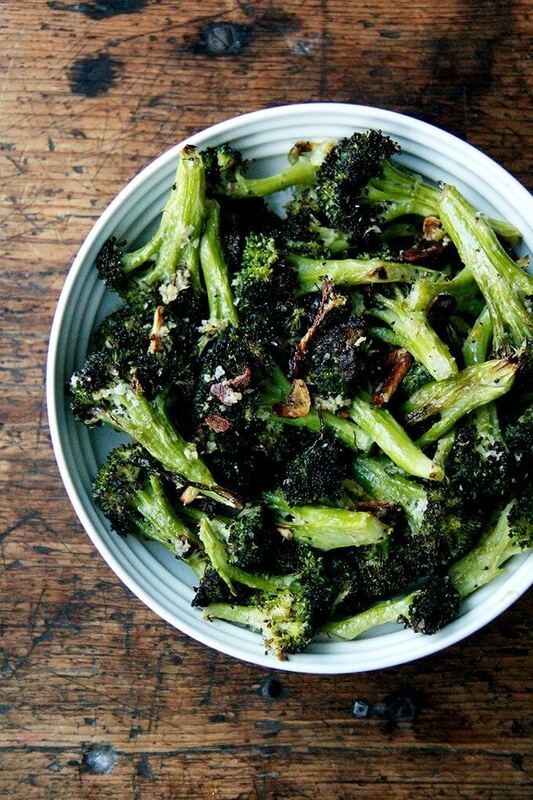 I made her charred broccoli salad for dinner that night, then again on Wednesday, and again on Thursday. I always have broccoli on hand. It’s a vegetable my children eat with little complaint: boiled, well buttered, well salted. It’s a vegetable that appears in our farm share in late summer, but I find it tastes good, even from the unpleasant grocery store, year round. Most often I roast it. I like it very charred. 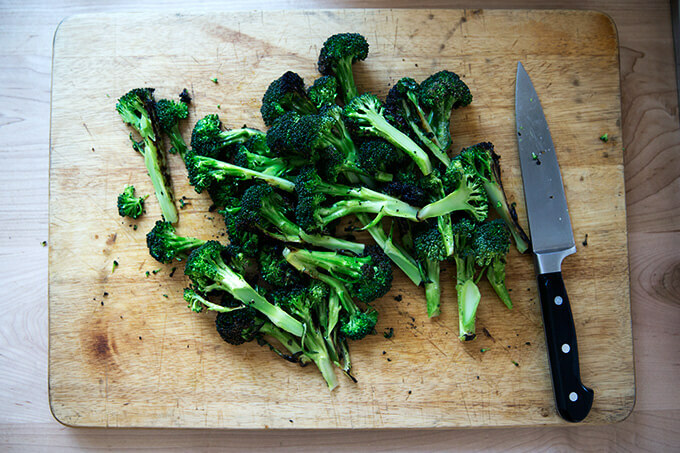 Here, halved broccoli heads sear for about five minutes on one side and just one to two on the other. In the end, Carla says, “a cake tester should meet firm resistance when inserted into the thickest part of stem.” The result is firm stalks with tender, charred florets. When you first taste this salad, you may find it sturdier than you are used to. But as you continue to eat it, which I suggest you do with a fork and knife, I think you’ll find the texture surprisingly nice, a refreshing change from fork-tender broccoli. 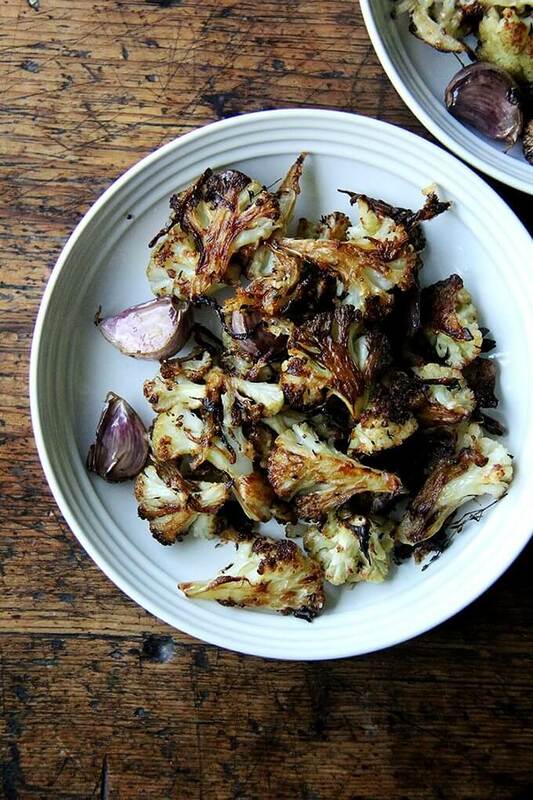 I also think you may find the texture, after months of eating roasted vegetables, to be, in fact, perfect. This is a great salad to make ahead of time or bring to a party as it holds very well and tastes even better with time: as it sits, the almonds, dates, and cheddar soak up the flavors of the dressing, a mix of olive oil, vinegar, and honey. 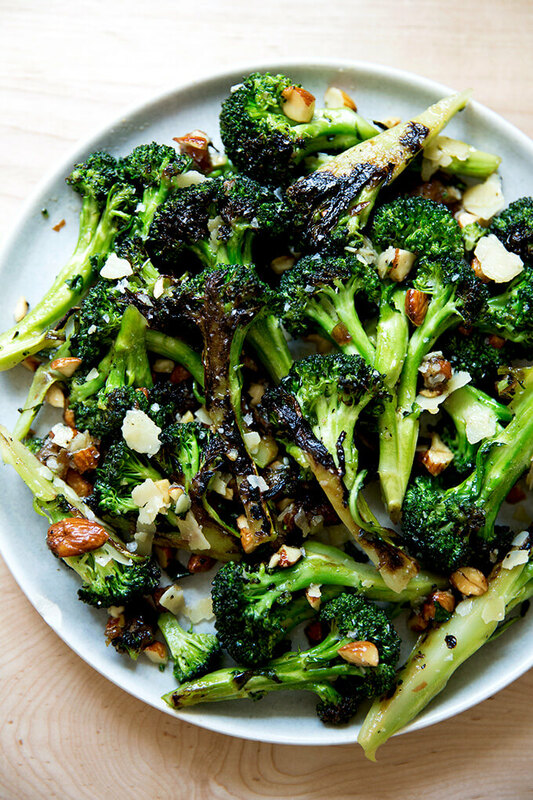 The broccoli remains firm as time passes, but it, too, absorbs the dressing, becoming more flavorful. I’ve spent little time with Where Cooking Begins, which focuses on both techniques and recipes, but I have many pages and recipes flagged, and I sense it’s a treasure, a collection of pearls amassed over many years from many sources: from her mother, who loved to cook, from work as a restaurant line cook, and finally from testing and creating recipes for Bon Appetit for over a decade. I’m looking forward to learning so much more. As always, I’ll keep you posted. Here’s the play-by-play: Gather your ingredients. Small-ish broccoli heads are good for this one. Sear them. Five minutes on the first side. One to two minutes on the second side. 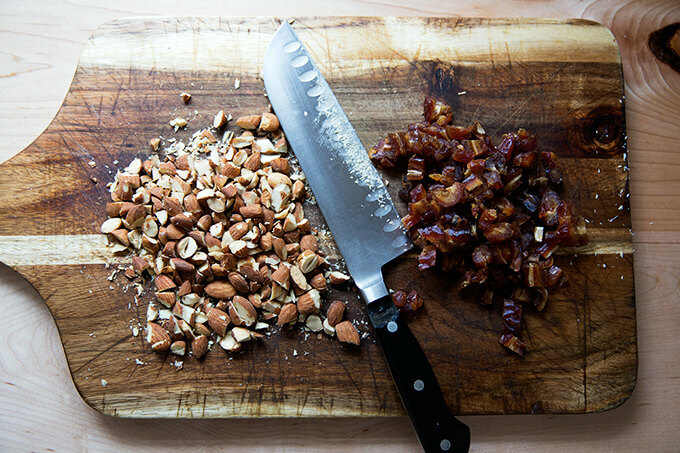 Chop some dates and almonds. 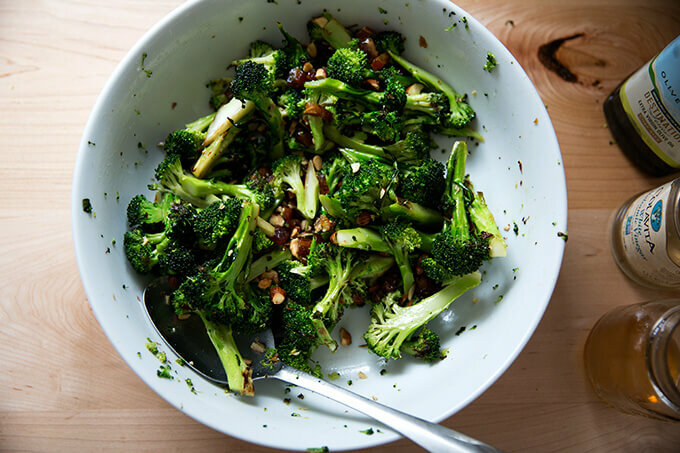 Dress the broccoli with salt, oil, vinegar, and honey. Toss. Add the dates and almonds. Carla Lalli Music’s Where Cooking Begins. 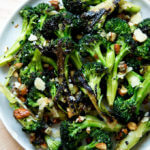 As noted in the post above, the broccoli in this salad is pan-seared, which allows the edges to get charred while keeping the stalks/bodies firm. 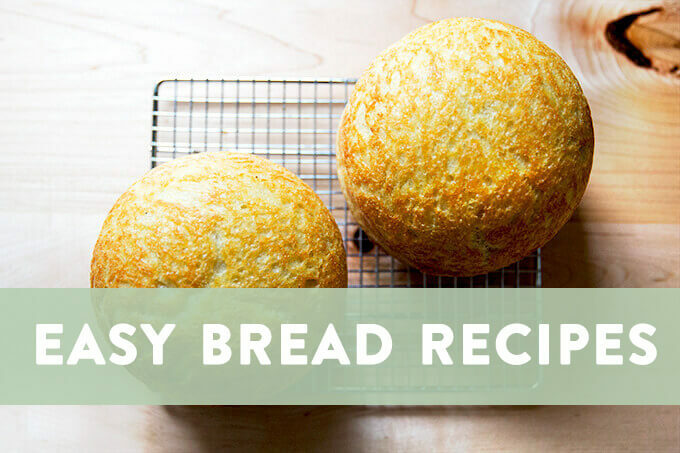 I think you should make the recipe once as directed — the texture may be firmer than you are used to, but I think you’ll find it really nice and refreshing as you eat it. If you find it too firm, next time, sear the broccoli for a longer amount of time on the second side. 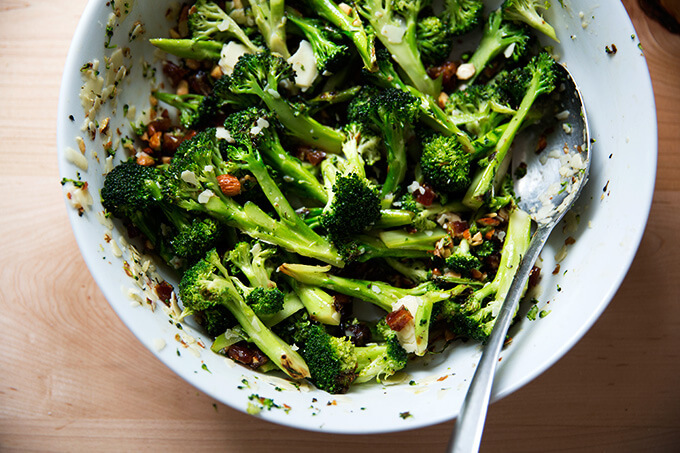 I find small heads of broccoli work best for this salad. This is a salad that can be tailored to your liking. Depending on the size of your dates, you may only need 4 or 5. You may find that the honey is unnecessary given the dates provide a nice sweetness. (I always add the honey.) If you can’t find Marcona almonds, regular almonds are fine — I’ve been using roasted, salted almonds. Other cheeses could work in place of the cheddar, though the cheddar is really nice. 2 to 3 small broccoli heads, 1.25-1.5 lbs. Trim woody ends from broccoli stalks, then cut heads away from stems. Peel stems and halve lengthwise. 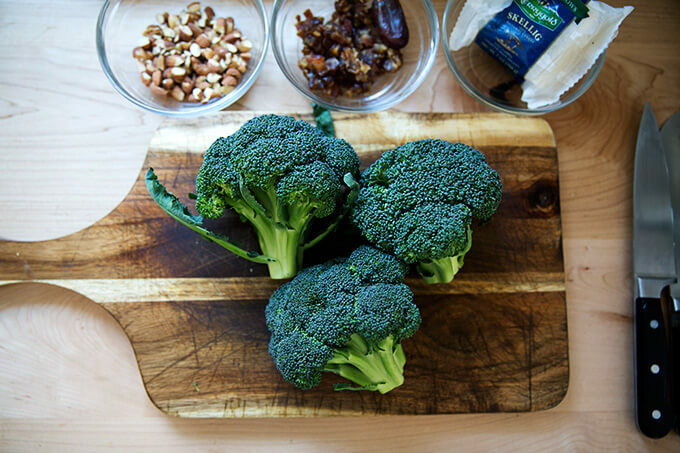 Cut broccoli heads in half through the crown to create two lobes (don’t separate into florets). Heat a large skillet over medium-high heat. Add 2-3 teaspoons oil to pan. 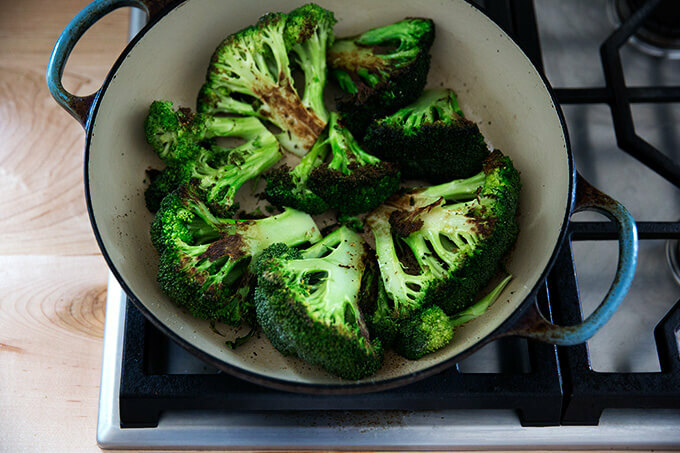 Place broccoli in skillet cut side down. Season all over with salt and pepper to taste. 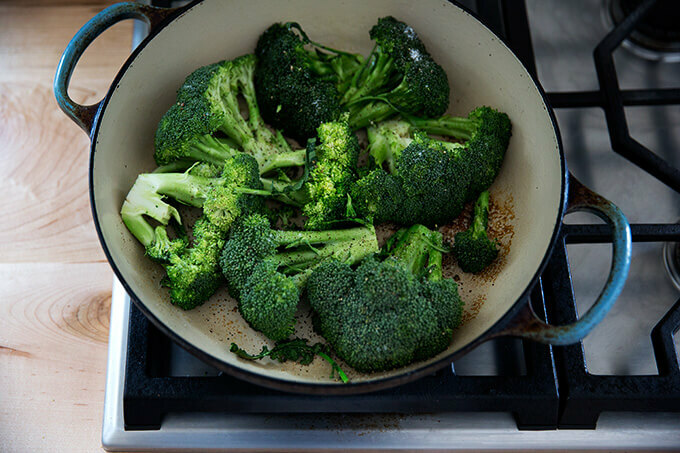 Cook undisturbed for about 5 minutes or until the undersides are well browned but broccoli is still crunchy — a cake tester should meet firm resistance when inserted into thickest part of stem. Turn heads over onto floret size for a minute, just to lightly brown rounded sides, then transfer to a cutting board. 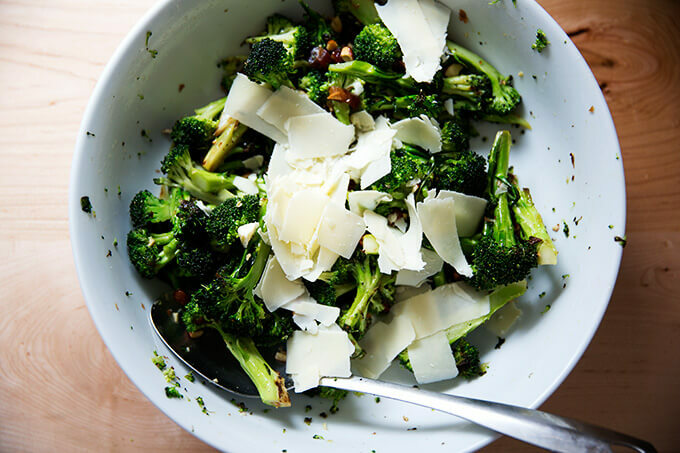 When cool enough to handle, cut broccoli heads and stems into 1/4-inch (or slightly larger) slices and transfer to a large serving bowl. Add the vinegar, 1 tablespoon olive oil and the honey. Season generously with sea salt. Toss. Taste. Adjust seasoning with more olive oil, vinegar, and salt to taste — I’ve consistently been adding at least another tablespoon each of oil and vinegar. 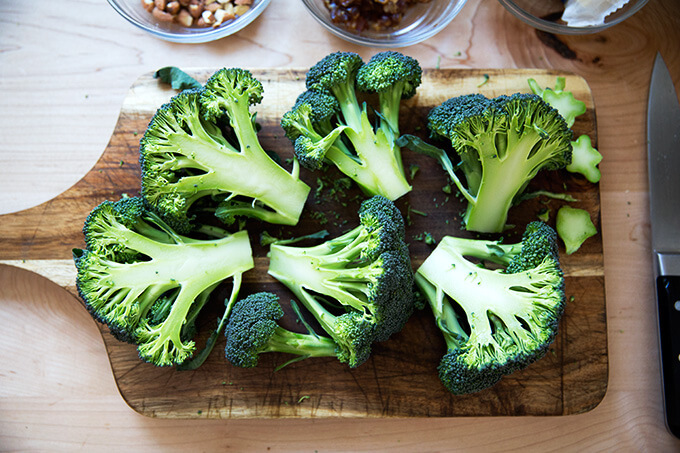 And I find the broccoli can really handle the sea salt, so don’t be shy — salt till it tastes good. Add the almonds and dates and toss again. Add the cheddar and toss one final time. Serve immediately or let stand for hours before serving. 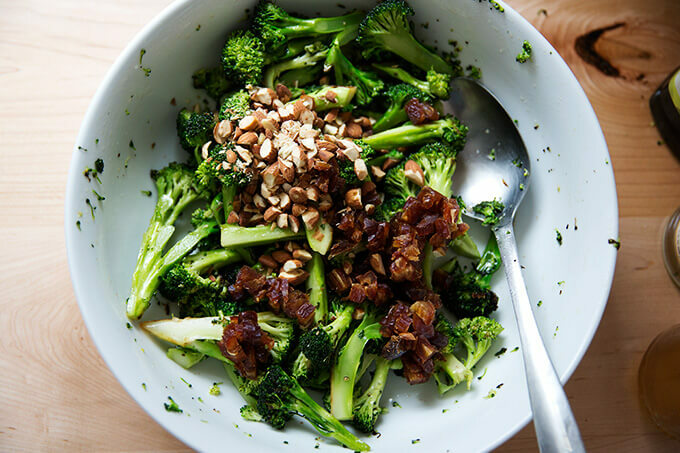 This salad gets even better as it sits — the dates, almonds, and cheddar soak up the dressing, while the broccoli remains firm (while also absorbing the flavors of the dressing). This is a salad to be eaten with a knife and fork. 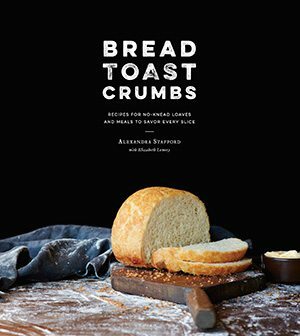 Love this simple recipe and introduction to a new cook and book. I downloaded it a few minutes ago and gave it a quick content scan. I am looking forward to exploring it. Thank you, once again, for bringing someone new to some of your readers. Yeehaw! It’s such a treasure! I was reading it again this morning and have even more recipes bookmarked. So many smart tips, too. Yikes. I love your blog and I know you probably didn’t intend it this way but this strikes me as pretty classist. Maybe keep in mind that for some of us without the kind of CSA access you’re lucky to have, the “unpleasant grocery store” is our only option to nourish our families and ourselves. Oh goodness, I’m sorry, that was not my intention at all, and I can see how it is offensive, and for that I am sorry. I only said it because I shop at the “unpleasant grocery store” often — I have to. I couldn’t shop at a Whole Foods or a fancy co-op without spending our entire pay check. But that doesn’t mean I don’t find the experience at the local big box grocery store unpleasant — I truly find it unpleasant. I hate it, in fact. I hate the sea of aisles and how it takes forever to do my shopping because the scale of the whole thing is just so large. I hate all the products. But I go. I go for produce, milk, cheese, eggs, and sometimes meat. And ironically, the CSA is actually the most affordable shopping I do. A weekly share, which is more than enough to feed my family, comes out $26.25. I do a CSA because I get delicious, fresh produce without the farmers’ market prices. I’ve never found a way to leave the farmer’s market without spending double that for about half the amount. I actually spend more at the unpleasant grocery store than anywhere else. Again, I’m sorry for how the sentence came off the way it did. I hate thinking about sounding classist or elitist. It’s really not me. Don’t let others put a label on you, for one part of one comment. I love your blog and at 76, it’s one of 4 that I continue to be inspired by. Thank you so much, Suz. This really means a lot. Appreciate you reaching out. Truly. Alex. Thanks for the make-ahead recipe! It’s gone strait to the “hot to try” file! I agree wholeheartedly with the poster above. 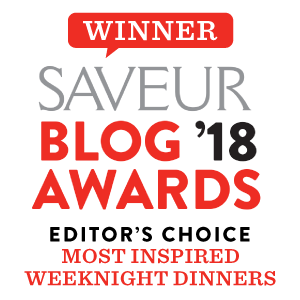 Your blog is truly outstanding and inspirational. In fact it is my favorite. 🙂 I wanted to add that I agree with you. I depend on big box stores, but that doesn’t mean I have to like it. I don’t like all the processed food, the massive amounts of packaging and I really hate buying lettuce from plastic clamshell containers. But like you, I find that I can pay up to double elsewhere for the same imported produce. Purely math and my shoestring budget. Nothing classist about that. Just made this tonight and it was delicious!! Instead of analyzing your words, people should spend more time making your recipes!! People feel they can just type out ANYTHING!! They would never have said it in a conversation with you. Well, I continue to love your recipes, and I thank you for all that you do! Thank you so much Kim… really means a lot 🙂 Thank you for taking the time to write. It’s not the first critical comment I’ve received, of course, but still, it’s never that easy to brush off. So glad you liked this one!! 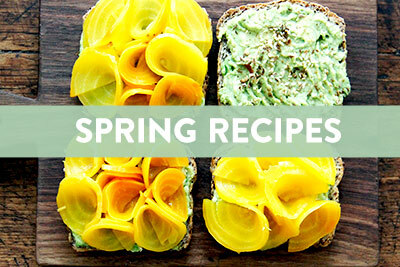 Wow, this is such an incredible recipe! I made it tonight and it was delicious, not to mention so simple and quick– perfect for an easy weeknight dinner! Thank you so much for sharing it. I will definitely be making this again! So happy to hear this, Arianna! I’m just diving into this beautiful book and finding it really inspiring. So happy to come across your lovely post. This dish is going onto my must-make list! Isn’t it good? I’m really loving it, too. Turned this salad into a five star main course. Charred the broccoli with some scallions that had seen better days. Served on a bed of greens with grilled chicken( you could add any protein). 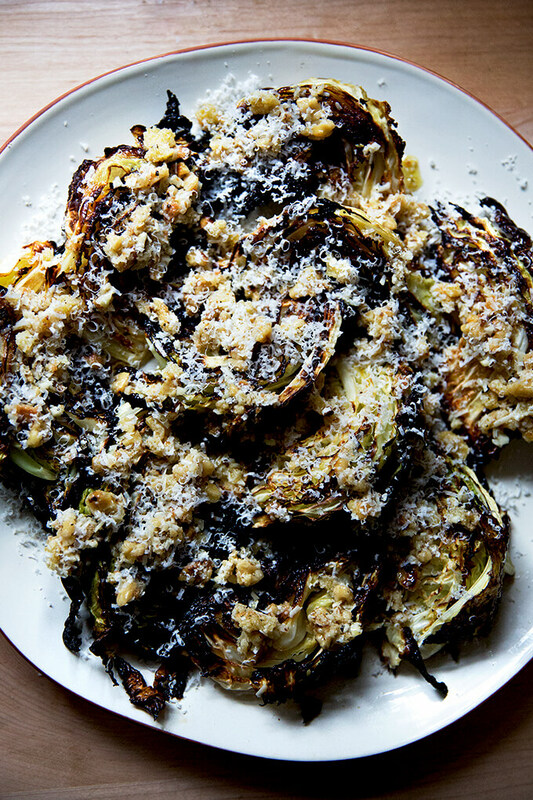 Topped with regular almonds and dates—no cheese—it was amazing! I love your blog. It has turned me into a bread baker. 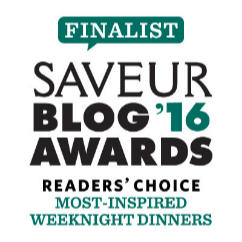 Thank you for all the great recipes! Oh Patrice, wonderful to hear all of this! Thanks for taking the time to write. Your adaptation of the recipe sounds divine!